Conventional medicine focuses on treating and managing ailments once they occur. At Heart of Texas Chiropractic, we emphasize the importance of personal wellness to prevent illness and pain from occurring in the first place. Dr. Marilyn Goodman, BSN, BSA, DC was a nurse for 17 years in Denton and Houston before she became a chiropractor. During Dr. Goodman’s time as a nurse, she worked in the emergency room and the rehabilitation units. During the 80’s, she got into a severe automobile accident, and chiropractic was the only approach that helped her recover. This inspired Dr. Goodman to become a chiropractor and share the gift of chiropractic to others. She received her Doctor of Chiropractic degree from Parker University in Dallas. 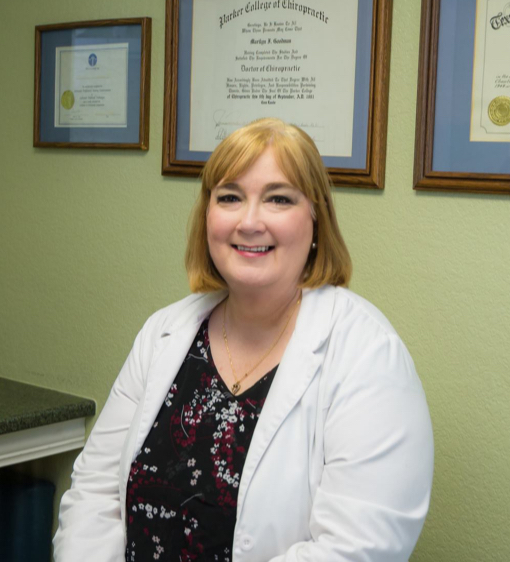 She opened Heart of Texas Chiropractic and has been serving Waco residents since 1991. Dr. Goodman uses chiropractic care and techniques to improve the general well-being of her patients. Whether they are having neck or back pain, or they want to improve their posture, Dr. Goodman takes a holistic approach in her chiropractic practice. This means that she determines the underlying causes of her patients’ pain and discomfort rather than just treating the symptoms. Dr. Goodman is certified in practicing the Activator technique. Dr. Goodman is Advanced Proficiency Rated and is certified to use the Activator Methods in Waco. The Activator instrument is expertly designed to provide a precisely controlled thrust without straining the patient. Dr. Goodman utilizes the Activator Methods to stimulate the nervous system and the joints before the body tightens up. The sought-after chiropractic technique is comfortable and effective for all patients – whether they’re pregnant women (before and after pregnancy), seniors, athletes, babies, and children. We have patients as young as 1 hour old and as old as 98 years old. Dr. Goodman is experienced in providing chiropractic care to newborns, infants, adults, and seniors. Her goal is for all her patients to achieve personal wellness.